Route 66 Extended Warranty provides “The Best Value in the Warranty Industry” to more than 1,500 credit unions, banks and financial institutions. When considering a company to provide mechanical breakdown protection for your institution, financial stability is of the utmost importance; after all, you depend on them to be there down the road to pay your claims. 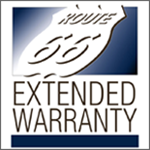 Route 66 Extended Warranty’s experience is unmatched with over two million plans sold. Financial Strength – 25 years of experience has allowed Route 66 Extended Warranty to build a strong financial foundation. Dunn & Bradstreet rate them a financially “strong” company. Although they have maintained such a rating, Route 66 Extended Warranty still chooses to protect each institution by insuring every service agreement win an AM Best “A” Rated Insurance company. Additionally, because their insurance participates in the State Guarantee Fund, your institution has three levels of financial strength. Customer Service – The hallmark of Route 66 Extended Warranty is their customer service. When a call is placed to their office, it is always greeted with a live, friendly voice, thereby eliminating the frustration of menus or voice mail during normal business hours. It is important to us that your customer always has the ability to speak to someone for answers. Web-Based Registry – Route 66 Extended Warranty provides a state of the art web-based solution that will allow your staff to produce a quote in as little as 30 seconds and generate a complete contract in less than one minute! Using the Route 66 Extended Warranty website, you can input the auto or motorcycle mileage and VIN to receive a quote or register an agreement. This easy to use web portal is one of their most common and frequently praised attributes. Claims - All claims are administered by Route 66 Extended Warranty, therefore never referring you to an unknown third party. Their $0 deductible plans provide fast and efficient claims processing with direct payment to the repair facility using their corporate Visa card. Their claims adjusters are ASE certified technicians who understand how important personal service is to your customers. Training – We often hear that Route 66 Extended Warranty training programs are vital to the success that our institutions experience. We provide on-site training for your staff and continued follow-up training as needed for new staff with turnkey rewards programs to incentivize each loan officer. Annually we will provide a refresher training in order to update you and your staff of the changes within the industry and again re-emphasize the importance of the program. The training programs will develop and sharpen sales skills and can be used with any product(s) that you offer. Fully customizable training to meet your specific needs is available. Coverage’s – Broader underwriting guidelines create an opportunity to capture more sales and also allow more of your customer’s vehicles to be covered under their best exclusionary coverage vs. having to settle for the competitions more limited coverage. Combining this and their any year/any miles program with their 25 years of developing the perfect balance of coverage and cost makes Route 66 Extended Warranty “the best value in the warranty industry”. If you are a financial institution who is looking for additional fee income, protection of your collateral, and the ability to provide your members with a valuable service, please Contact Us.